Armenia is regarding as the oldest Christian country in the world. The history of the Armenian civilization started in the sixth century BCE In the following centuries, Armenia experienced a wave of nomadic migration and numerous invasions which gave rise to a synergetic culture that combined elements of the Iranian social system with ancient Greek and, later, Christian traditions. In 301 CE Armenia adopted Christianity as the official state religion. Since ancient times, Armenia’s geopolitical position attracted interest of many political powers, and periods of independence were interrupted by times of occupation. In the 15th century, the country was divided between the Ottoman Empire and Safavid Persia, while in 1813 and 1828, Russia annexed eastern Armenia. The short period of political freedom in the aftermath of Red Revolution was preceded by establishing the Transcaucasian Democratic Federative Republic along with Georgia and Azerbaijan. In 1922 Armenia was included into the Soviet Union within the structures of Transcaucasian SFSR. Subsequently, in 1936 country became a entity of the Soviet Union as the Armenian Soviet Socialist Republic and such existed until dissolution of Empire. 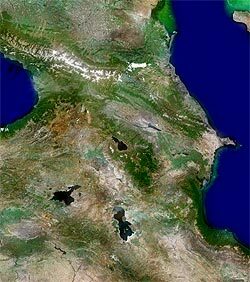 Following that event, Armenia gained independence, declaring sovereignty on August 23 1991, it was the first non-Baltic republic to secede. After the collapse of the Soviet Union, Armenia experienced a drastic shift from the planned economy system to market economy which resulted in a dissolution of all economic and social structures. This factor, along with the period of political instability and the territorial conflict with Azerbaijan, became a reason of slowing down the economic growth and worsening the life standard of people. Since mid-1995, however, the country has been back on the way to recovery, and implementation of a wide range of economic reforms, positively influenced the economic and social development. Armenian has resources of copper, zinc, gold, and lead. The vast majority of energy is produced with fuel imported from Russia, including gas and nuclear fuel (for its one nuclear power plant); the main domestic energy source is hydroelectric. Small amounts of coal, gas, and petroleum have not yet been developed. Agriculture, the traditional branch of Armenian economy, began to be complemented by newly developed sectors of communication technology, tourism, and the precious stone and jewellery industry. As the whole Caucasus region, Armenia’s culture was shaped by many different influences over the centuries. The country is currently dominated by Christianity, with 94,7% of people following the Armenian Apostolic Church. There is also an Islamic minority as well as followers of the ancient Yazidi religion, mostly Kurds. The Jewish community, once playing an important role in the Armenian culture, almost entirely migrated to Israel in the 1990s. Smaller groups: Vlachs, Mordvins, Ossetians, Udis, Tats, Poles and Caucasus Germans. Armenian diasporas (8 million): mainly in the United States, Russia, France, Iran, Georgia, Syria, Lebanon, Argentina, Ukraine, and Turkey.